ldai_phs wrote: The article also mentions Commuter Rail. Would the site also be part of that? The best answer at this point is maybe. It is the planned terminus of Jackson County commuter rail...but, until funding is secured the answer is maybe. The nice thing is they are planning ahead for it. Administrators: Now that a developer is established, can this development be spun off into it's own thread? Last edited by pash on Mon Feb 13, 2017 10:08 pm, edited 1 time in total. Has it been known that the 10th & Main transit plaza would be turned into a pocket park when the ATA abandons it? I thought they were going to try and develop it,. KCPowercat wrote: Has it been known that the 10th & Main transit plaza would be turned into a pocket park when the ATA abandons it? I thought they were going to try and develop it,. Pocket park with that nice fountain will be a nice amenity. Add more fountains! KCPowercat wrote: Pocket park with that nice fountain will be a nice amenity. Add more fountains! only if they come up with a conservancy or something. parks doesn't need another thing to maintain (because it won't get done). ideally, this should be vertical. KC has an enormous amount of parkland and access. I feel the same way about parks as I feel about roads, we should use and maintain the ones we have until we demonstrably need more. Coincidentally, or not I guess, but certainly in contrast to the majority of sentiment on this board, I feel similarly about a 670 cap. The 670 cap is a cute idea which, perhaps by the time anything gets around to actually being done, it may have become necessary. I agree with Dave. Ideally, this parcel should be a mid-rise building with retail on each side. The site sits directly on the streetcar line--lots of TOD opportunity. Look at current downtown park usage, and it is easy for any reasonable person to see that there is very little demand for the park space that exists now. One option might be to develop the 10th & Main site in such a way where there are some retail spaces at the back edge of the parcel with a outdoor public plaza in front with tables, where patrons can sit outside and eat. Make the public plaza part of the retail property for them to manage, and keep the responsibility out of the parks department. 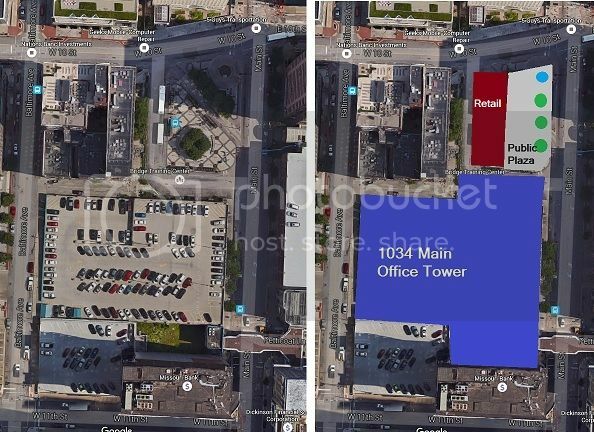 If the parcel was combined with the 1034 Main property, a tower could eventually be placed atop that parking garage and have the entrance to the building be on part of the transit parcel. Keep the retail building at one or two stories so as to not block the windows of the apartment building on the west side. Hopefully the KCMO voting systems won't be too slow as it was for the Primaries, causing long lines, potentially causing people to leave.